When we talk about "bear safety," people often think we mean keeping humans safe from bears (definitely an understandable assumption) when we actually mean quite the opposite. Bears that become accustomed to calorie-rich human food often stop fearing people in their quest to acquire more of this tasty food and become a threat to humans because of their newfound boldness. In order to protect backpackers and campers, these bears are often euthanized. Keeping a bear away from your food is keeping a bear alive. Know if you'll be backpacking or camping in bear country before you go. Ample resources exist online for seeing what type of wildlife you might encounter on your adventure, so make use of them! When you're planning your trip, check if bears inhabitat the areas you're considering, and if they are, bring an IGBC-approved bear canister. Failing to store food properly in a national park can result in fines up to $5000 and a jail sentence of up to 6 months, so don't take any unnecessary risks. Pack your food as efficiently as possible to allow all of your trip's food, toiletries, and trash (all of these items count as "bear food") to fit in your bear canister. Prioritize bringing foods that are high calorie density and either compact or compressible, and lay out exact food quantities for each meal on your kitchen table before you pack them into your canister. Avoid foods that have especially strong odors (like fish or smoked meats). Dehydrated foods are usually a safe bet, as they are low-odor and fill gaps well. We live and die by the 100 yard triangle: always cook your meals and clean your dishes at least 100 yards away from your campsite, and store your bear canister 100 yards from your camp kitchen and 100 yards from your campsite. 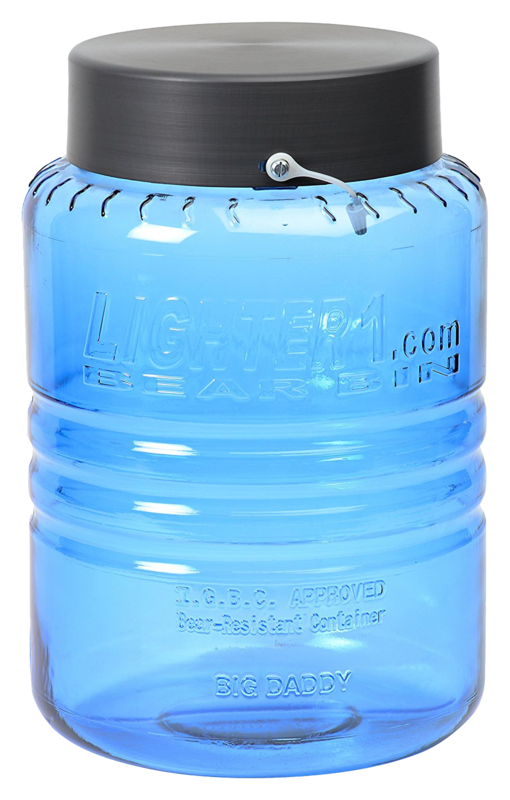 Place your bear canister away from slopes or water sources, as a bear will often bat a canister around to see if it will break against the ground or another hard surface. If possible, place your canister into a cleft or depression between rocks so it's already located in a low point. Bear Canister or Bag & Rope? People have been keeping food from bears by hoisting it up in trees for hundreds of years, so why not keep doing that? Here are our thoughts, in case you're interested. With a canister: (A) You don't have to spend time looking for an adequate tree or rigging up a rope system with a counterweight for accessing your food. (B) You can camp above the treeline. (C) You don't have to pack a rope with you. Our flagship 650 cubic inch polycarbonate bear canister, the Big Daddy clocks in at 2 pounds 4 ounces for your week-long backpacking needs. 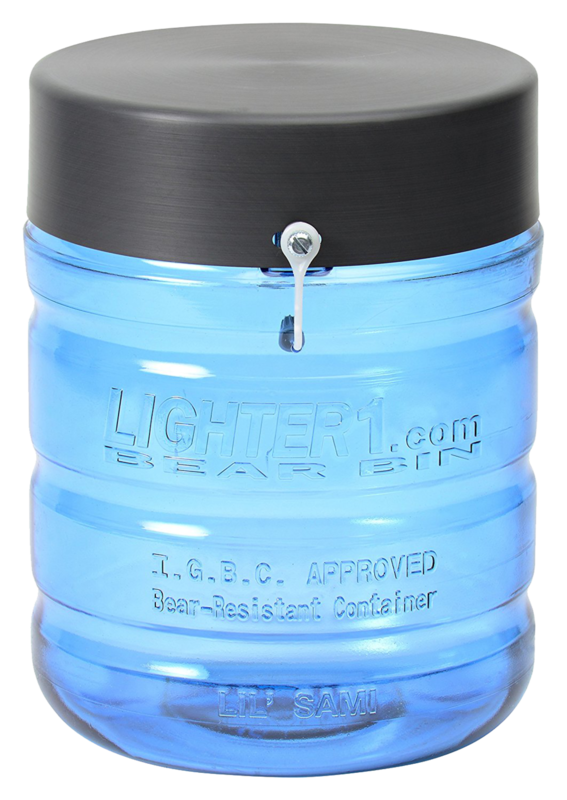 Weighing in at 1 pound 5 ounces, the 300 cubic inch Lil Sami is our space-saving bear canister solution for the multi-day backpacker.